The Spetsnaz have arrived! SSU forces won't let the Motherland in the hands of German tyrants, reactionary lackeys, American capitalists and international bankers! World Revolution arrives and no-one can stop it! The Spetsnaz are the most famous special forces on the planet and they will fulfill their mission or die trying. Whether you want to start a new SSU army or just expand the existing one in a cold environment, the Battlegroup Red Banner is perfect for you! All the models presented here are shown in Winter Spetsnaz colors, used all around Zverograd, circa Winter 1947. 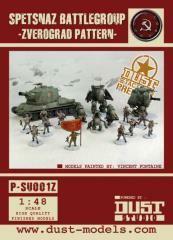 All models are available with their stat cards for Dust Tactics and Battlefield. As usual, everything you see on the pictures is there: the weathering, the effects, the crews, etc. Our Studio has done its best to deliver the most amazing painted miniatures. The Premium Edition models are not just “pre-painted”. What is offered is the exact replica of Vincent Fontaine’s work, Dust Studio’s Master Painter.